The Simon game’s never really gone away, because there are so few simple pleasures in life anymore: like reading without interruption, or unquestioningly carrying out the orders of a machine with four lights. But Hasbro has had to make some adjustments to the game over the years, including offering an Air version that made for a pantomime of the old slap-heavy action. But Gizmodo reports that Simon’s latest upgrade will probably make you look even more ridiculous while playing, in part because you have to wear it. The sporty headset’s motion sensors will continue to pick up on whether you’ve actually obeyed Simon’s commands. 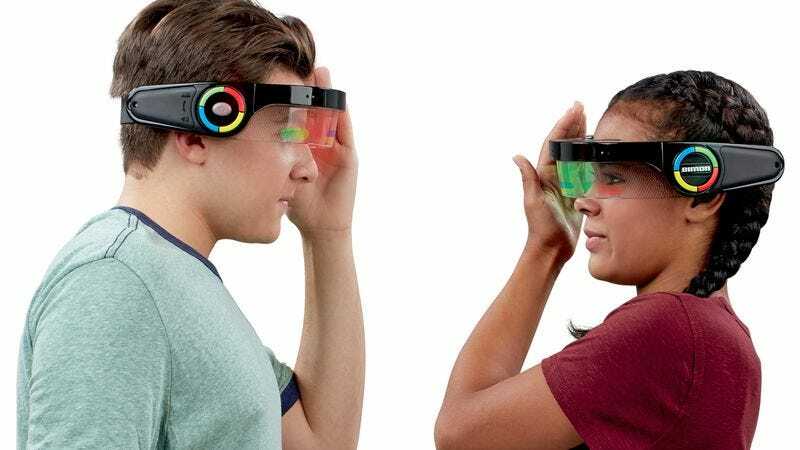 You can even engage in one-on-one mode against whomever you’ve convinced to buy and also wear the new headset, thereby creating gaggles of people who will stand around, swatting at flashing lights. If you think this sounds like some kind of conspiracy to turn humans into cats, you’re not alone—has anyone ever met this Simon?